Wrapup: The predicted bad weather held off, and it was a beautiful night for a get-together. We had over 30 cars meet up for a short casual drive, and we were joined by a bunch more at Superdawg. There were lots of newer and prospective members, a few people who haven’t been out to an event in quite some time, and also many who attend lots of events. 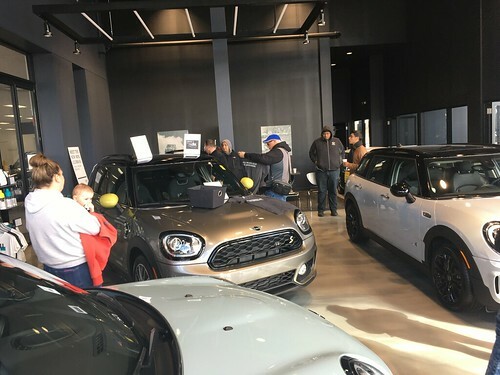 There was plenty of time to socialize as well as time to hang out and check out all the newer R56’s, a Clubman and a fabulous classic. Big thanks to Arnie for helping make arrangements with Superdawg to allow us to take over their place for the evening. E-mail links to photos to steve@chicagominiclub.com (please not the actual pictures because I don’t have the mailbox space), and I will link them in here. We would like to Thank Dustin for the countless hours invested to create some of our clubs biggest and best events over the last 18 month.